I am not a fan of piñatas. Not at all. If someone can tell me why giving blindfolded children a stick and telling them to swing while adults move the target everywhere is a good idea, I would love to hear! Especially when, if they actually brake open the piñata, all the kids dive on the ground and fight to get all sugared up. But I do think these individual star piñatas are super cute. 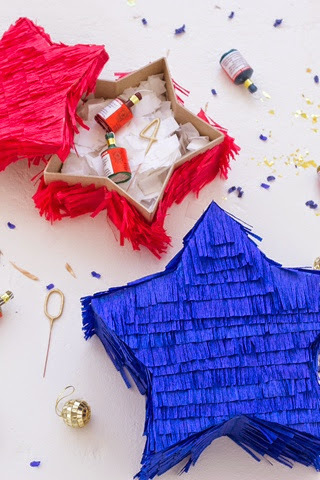 If you made one for each person and used them to decorate your patriotic party with, I can totally understand having these star piñatas at your party. Go visit Kelly and see how these star piñatas are made.